Byron A. Baldwin, "Nathaniel Baldwin and One Line of His Descendants", The New England Historical and Genealogical Register Vol. 25 (April, 1871): p. 154. Charles Cander Baldwin, The Baldwin genealogy from 1500 to 1881, , at https://books.google.com/books?id=LYoJAwAAQBAJ . Cleveland, O.: The Leader Printing Company, (1881) , p. 423. 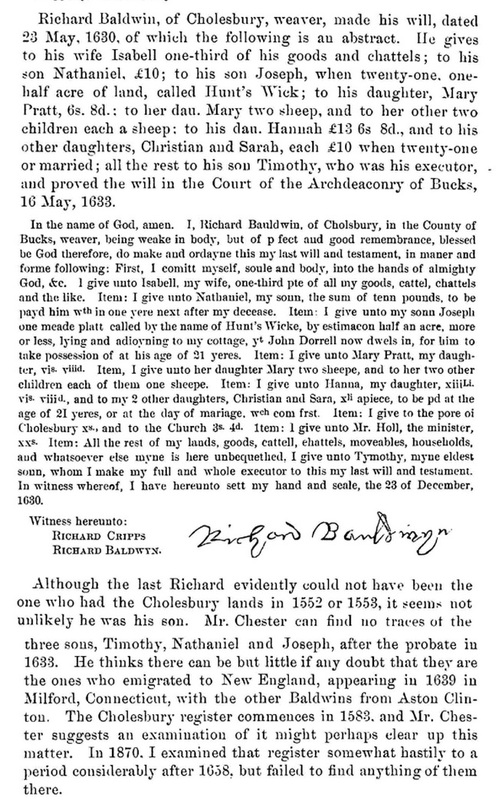 Byron Anastasius Baldwin, Nathaniel Baldwin and one line of his descendants, Boston: Printed by D. Clapp & Son, (1871) , p. 7. Ralph D. Smith, "Edward Frisbie, of Branford, Conn., and some of his descendants", The New England Historical and Genealogical Register, Vol. 58, , at https://books.google.com/books?id=1ehX37u0AuAC . Boston: New England Historic Genealogical Society, (1904) , p. 181. 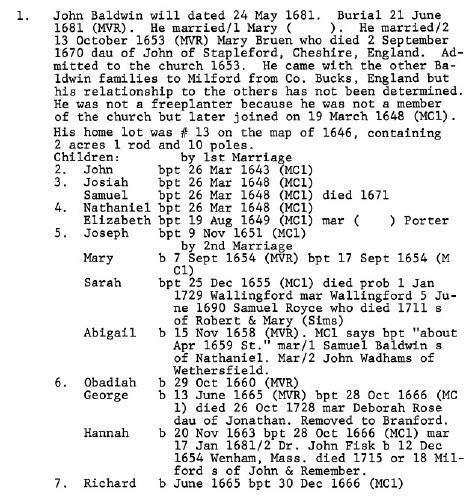 "Connecticut Births and Christenings, 1649-1906," database, FamilySearch (https://familysearch.org/ark:/61903/1:1:F74R-F52 : 3 December 2014), Samuell Rose, 27 Mar 1706; citing ; FHL microfilm unknown. 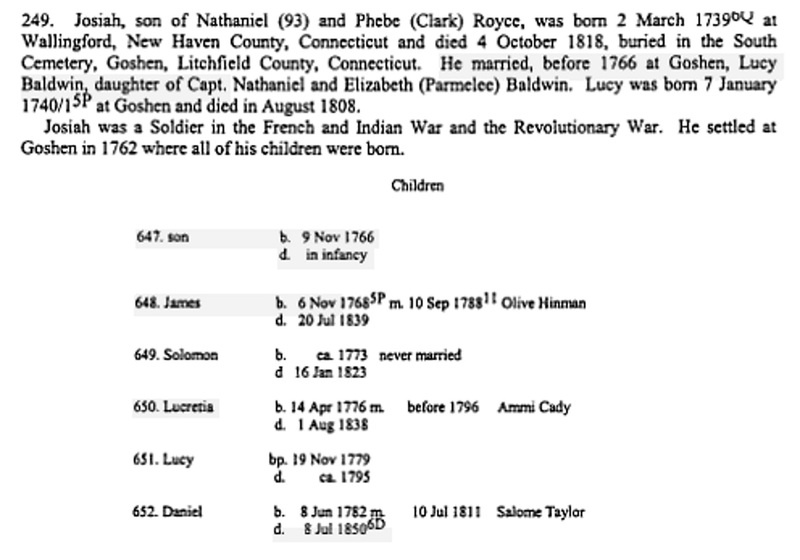 "Connecticut Births and Christenings, 1649-1906," database, FamilySearch (https://familysearch.org/ark:/61903/1:1:F74R-FYM : 3 December 2014), Nathaniell Rose, 12 Feb 1709; citing ; FHL microfilm unknown. Ralph D. Smith, "Edward Frisbie, of Branford, Conn., and some of his descendants", The New England Historical and Genealogical Register, Vol. 58, , at https://books.google.com/books?id=1ehX37u0AuAC . Boston: New England Historic Genealogical Society, (1904) , p. 182. 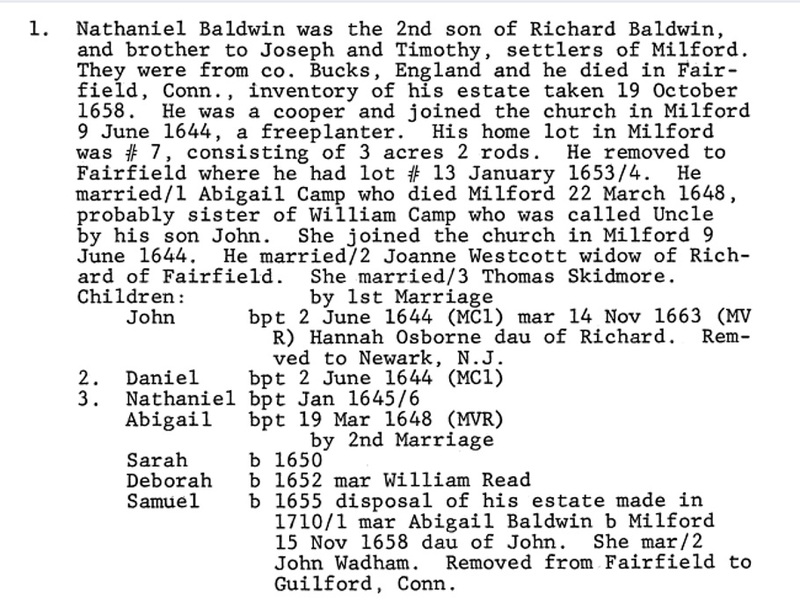 Byron A. Baldwin, "Nathaniel Baldwin and One Line of His Descendants", The New England Historical and Genealogical Register Vol. 25 (April, 1871): p. 153. Susan Emma Woodruff Abbott, Families of Early Milford, Connecticut, , at https://books.google.com/books?id=RJcfa0INt4IC . Baltimore, Maryland: Genealogical Publishing Co., Inc., (1979) , p. 43. Craig Hart, A genealogy of the wives of the American presidents and their first two generations of descent, Jefferson, N.C.: McFarland, (2004) , p. 95. 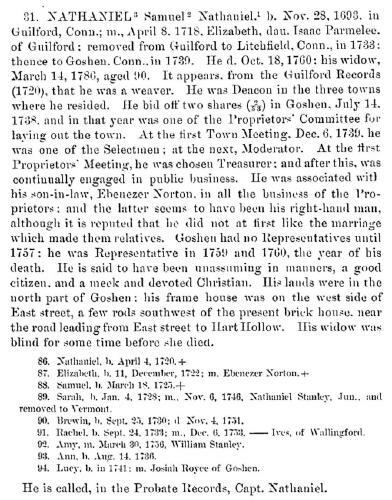 Richard Anson Wheeler, History of the town of Stonington, county of New London, Connecticut, from its first settlement in 1649 to 1900: with a genealogical register of Stonington families, enealogical Publishing Co., (1977) , p. 224. Susan Emma Woodruff Abbott, Families of Early Milford, Connecticut, , at https://books.google.com/books?id=RJcfa0INt4IC . Baltimore, Maryland: Genealogical Publishing Co., Inc., (1979) , pp. 14-15. James Savage, A Genealogical Dictionary or The first Settlers of New England showing Three Generations or Those who came Before May, 1692 on the Basis of Farmer's Register, (1862) , vol. 1, p. 102. Almira Larkin White, Ancestry of John Barber White and his descendants, , at http://books.google.com/books?id=hY9bAAAAMAAJ . Haverhill, Mass. : Press of C.H. Webster, (1913) , p. 188. Almira Larkin White, Ancestry of John Barber White and his descendants, , at http://books.google.com/books?id=hY9bAAAAMAAJ . Haverhill, Mass. : Press of C.H. Webster, (1913) , p. 189. George Sheldon, A History of Deerfield, Massachusetts, , at https://books.google.com/books?id=zmwWAAAAYAAJ . Greenfield, Mass. : Press of E.A. Hall & Co., (1896) , vol. 2, p. 54. 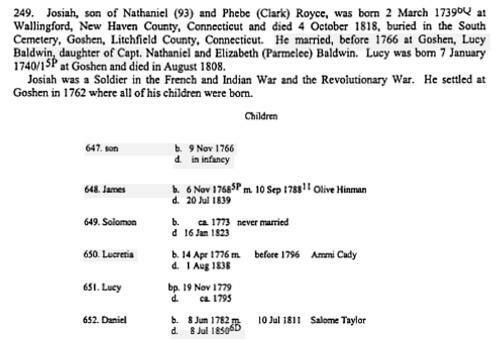 Byron A. Baldwin, "Nathaniel Baldwin and One Line of His Descendants", The New England Historical and Genealogical Register Vol. 25 (April, 1871): p. 155. Alvin Lee Rhods, The Royce Family in America, , at https://books.google.com/books?id=e-5OAAAAMAAJ . Madison, AL: (2005) , p. 59. Augustine George Hibbard, History of the town of Goshen, Connecticut, , at https://books.google.com/books?id=OutSAAAAYAAJ . Hartford, Conn.: Press of the Case, Lockwood & Brainard Co., (1897) , p. 411. Reuben Hyde Walworth, Hyde genealogy: or, the descendants, in the female as well as in the male lines, from William Hyde, of Norwich, with their places of residence, and dates of births, marriages, &c., and other particulars of them and their families and ancestry, , at Albany . Higginson Book Co., (1864) , p. 310-311. Charles Cander Baldwin, The Baldwin genealogy from 1500 to 1881, , at https://books.google.com/books?id=LYoJAwAAQBAJ . Cleveland, O.: The Leader Printing Company, (1881) , pp. 23-24. Charles Cander Baldwin, The Baldwin genealogy from 1500 to 1881, , at https://books.google.com/books?id=LYoJAwAAQBAJ . Cleveland, O.: The Leader Printing Company, (1881) , p. 434. Millie E. Baldwin, Baldwin ancestry, San Francisco: Press of F. Eastman & Co., (1904) , p. 6. Byron Anastasius Baldwin, Nathaniel Baldwin and one line of his descendants, Boston: Printed by D. Clapp & Son, (1871) , p. 4. 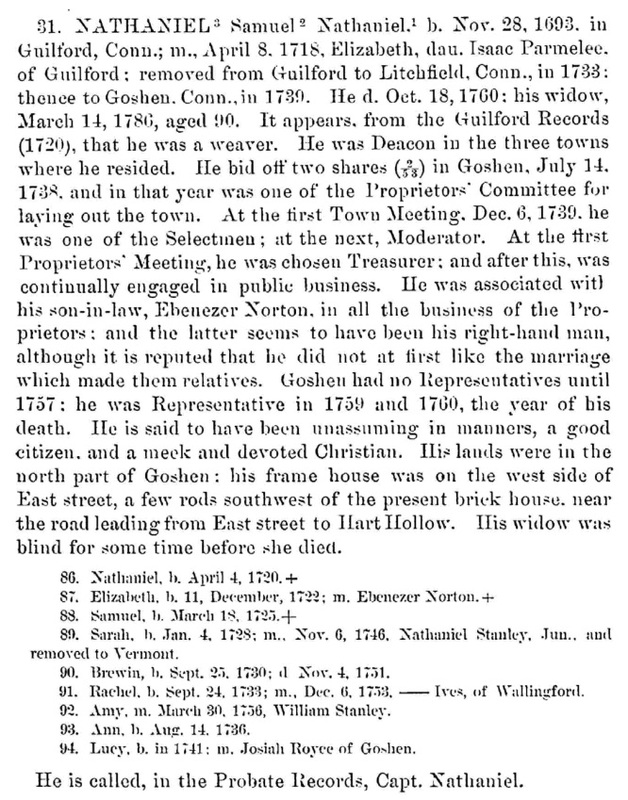 Unknown author, History of Goshen (n.p. : n.pub., unknown publish date), p. 52. 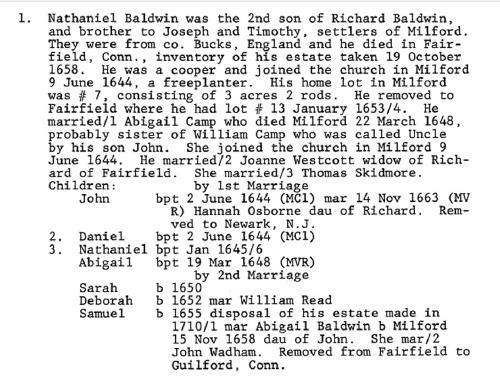 "Connecticut Births and Christenings, 1649-1906," database, FamilySearch (https://familysearch.org/ark:/61903/1:1:F7WY-ZJ6 : accessed 16 October 2015), Obadiah Baldwin, 29 Oct 1660; citing ; FHL microfilm unknown. 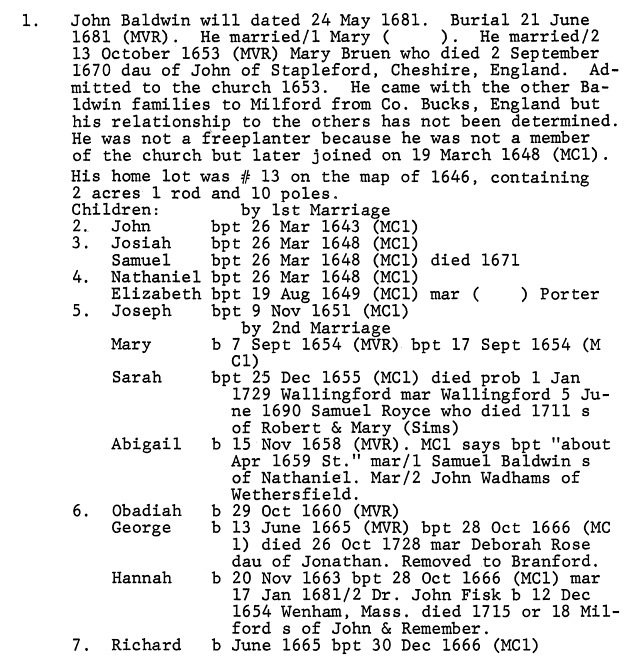 "Connecticut Deaths and Burials, 1772-1934," database, FamilySearch (https://familysearch.org/ark:/61903/1:1:F7HL-NMP : accessed 16 October 2015), Obediah Baldwin, 1738; citing Milford, Connecticut, reference ; FHL microfilm 3,083. 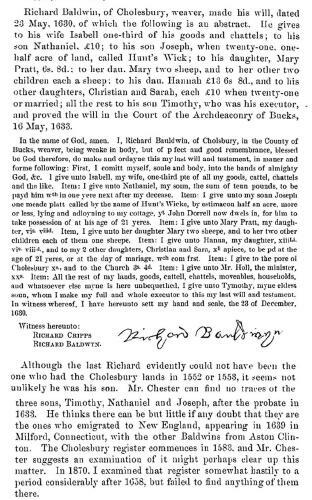 Richard Baldwin was born perhaps about 1573.